108. Russian Officers (Dis) cussing the War News, St. Petersburg, Russia. 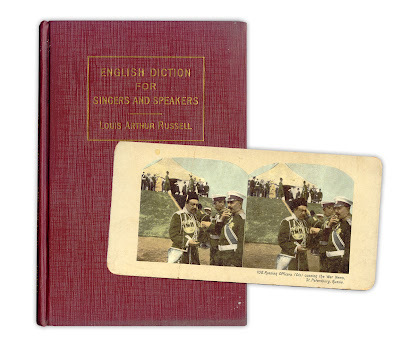 Found in "English Diction for Singers and Speakers" by Louis Arthur Russell. Published by the Oliver Ditson Company, 1905. I'm so glad I found your blog! :)This is such a great idea. Wow this is such a great idea. Like this post too.... so old timey! LOVE your website! I collect these stereoscope cards. What a great find! Thank you for continuing to post every day! So much fun! What a cool site! I once found an old hand written check from the 20s in a book that I had bought at a yard sale. I treasured that find for many years. I am sure to be back to discover what you've discovered! I sent some traffic your way with a mention on my blog - I think this is just the most charming idea. I love the Russians. And your blog.